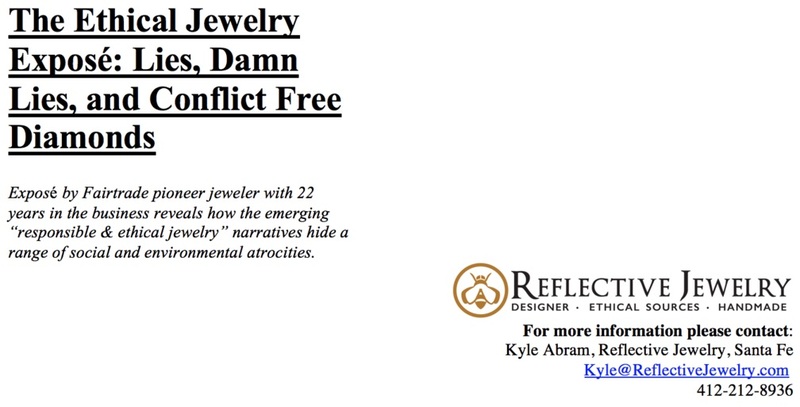 Santa Fe, NM October 17, 2018: Reflective Jewelry announces the publication of the Ethical Jewelry Exposé: Lies, Damn Lies, and Conflict Free Diamonds written by its President, Marc Choyt. This is the first Exposé ever written by a jeweller about the jewelry industry. Choyt’s series of articles unmasks specious trade and consumer narratives behind one of the jewelry trade’s hottest trends: the emerging “ethical/responsible jewelry” market. The work documents how the emerging “responsible jewelry” narratives are based on hiding crimes in plain sight, and that initiatives for producer communities that have little impact on the broader supply chain or market are magnified to act as an effective diversion, allowing for large-scale multinationals to continue their business as usual. Essentially, consumers believe their purchases are making a difference in the world when they are not. The work itself, over 40,000 words in length, is a series of fifteen interlinked articles. Through the central metaphor of a Russian nesting doll, the reader is taken on a journey through the various layers of spin, revealing the current structure in which the long-standing historical neo-colonial edifices producing poverty and suffering among small-scale mining communities remain rooted in place. The Exposé also includes a Call to Action, “The Ethical Jewelry Manifesto,” which outlines the need for a new and renewed ethical jewelry movement, a kind of reconstruction based upon a collaboration between jewellers, NGO watchdogs, and small-scale producer communities that is focused on disrupting the current narratives and a commitment to moral veracity based on social and environmental justice and the elimination of poverty. Importantly, the book argues that any responsible/ethical jewelry claim must be linked to improving the lives of small-scale producers and supporting a broad fair trade jewelry movement in North America for the benefit ethically-concerned consumers and hundreds of thousands of small-scale miners worldwide. 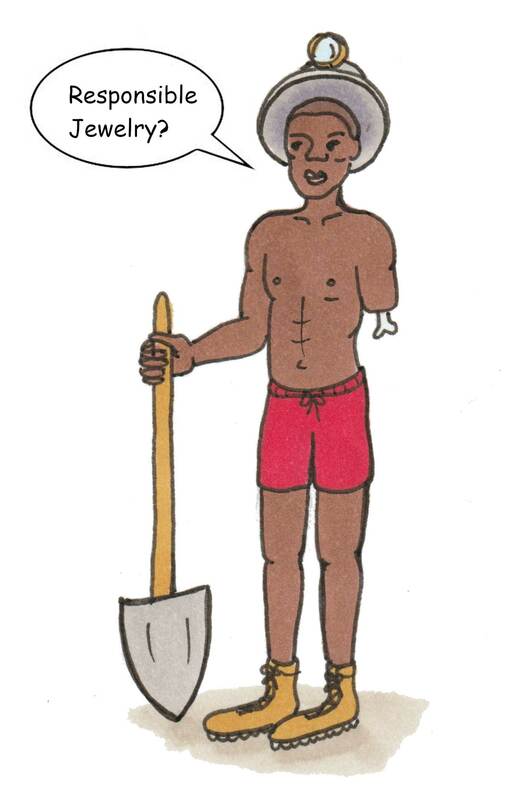 The book is fully illustrated by Alyssa Barstow, a Philadelphia based artist; and was edited by Kyle Abram. It has been published, free and available to the public, as an open-source document, under the Creative Commons. Any content or illustration can be republished online with attribution linking back the book’s landing page. Choyt is President of Reflective Jewelry, and co-founded Reflective Jewelry with his wife, CEO and Creative Director Helen Chantler, in 1995. He initiated the first ethical jewelry blog in 2006, which evolved into Fair Jewelry Action, a human rights and environmental justice network. Over the past ten years, he has been a trade watchdog, freelance writer for trade magazines, campaigner for Indigenous miners' rights, and an anti-mining activist in his hometown of Santa Fe, NM, where he has lived for over thirty years. He earned his undergraduate degree in English from Brown University and has a Masters in Humanities from St. John’s college. Reflective Jewelry is a brand of Reflective Images Inc. The company has been the only certified Fairtrade Gold jeweler in the US since April 2015. The company was founded in 1995 under the direction of Helen Chantler, who is the CEO and Creative Director of the company in partnership with Marc Choyt, who serves as President, directing business operations and the company’s ethical sources platform. The designer company has a brick-and-mortar store in Santa Fe, NM; offers jewelry, wedding rings, and engagement rings, has also sold their product to premium companies, catalogs, and hundreds of stores nationwide. The company won a Sustainable Santa Fe in 2014, an award for Sustainable Leadership from NM Green Chamber of Commerce in 2012, and were honored in 2010 by Jewelers That Care.